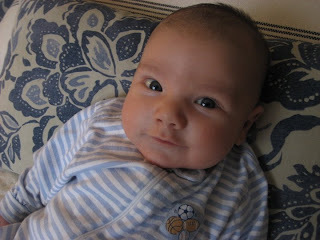 well, baby graham, your official two-month birthday isn't until the 14th, but we've reached the eight-week mark. mama simply cannot believe how grown-up you are! 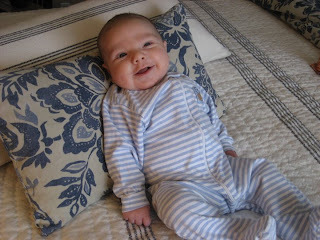 you are BIG, my son...already fitting into 3-6 month size clothes. i can't wait to find out how tall you are, and how much you weigh. you haven't made life too easy around here the last 4-6 weeks. you like to cry. a lot. but, slowly, we have figured out what makes you happy. still, you exercise your lungs quite a bit. the vacuum seems to soothe you, as do the bathroom exhaust fans, and the dryer. you get relegated to the laundry room a lot. poor thing. when you are happy, we LOVE to see your beautiful smile, listen to you "talk" to us, and watch you kick and bat at things. you love it when we sing to you. your very favorite song is "ho-ho-ho-hosanna" and when you hear it your face instantly lights up! when i click my tongue you stop to listen so intently. i can see the wheels turning in that head of yours...you're trying to figure out how in the world mama is making that noise! you like it when harrison goes to stay with grammy & papa for the weekend because you get to be held, rocked, and talked to all day long. you need that individual attention. and mama & daddy love to give it to you. we love you more than life itself, sweet boy! you are a blessing from the Lord. and we pray that you continue to grow stronger (and happier) each day! 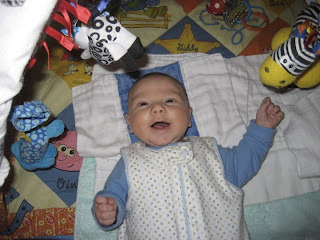 ***just for fun: graham's two-month check up is this coming friday, the 16th. leave a comment and guess how much he's going to weigh.